Great catch! Are the captops truly brown or black? For almost twenty years no one had seen a pencil. Now in the last four years we have seen three or four. Love to see the listing for the auction. Edited by Rick Propas, 26 May 2012 - 07:55.
the cap logo of the pencil is bluegrey (with my eyes). The colour of the other captops? Mmmh, I can't describe, so I'll post a better pic. Btw I'm just in contact with Regina Martini and she says, that there never was a pencil in such a set. I mailed her a copy of your post from January 2010 and with your permission (I hope) your pics, you posted above. I think, that my set is the same as yours. I'm curious to see what she says. Today I'm the luckiest man in town! I've never thought, that I can get this set into my collection of 800s and I've also never thought, that I would find it on ebay (Thank you so much my friend from Seoul for your advice) and that nobody without me will bid. So here it is, have a look. Congratulations on your winning m800 tortoise sets. so I contacted you as soon as I found the listing. Again: Thank you so much 1000 times for your helpfulness and your selflessly advice! My mantra is that the pen is the authority. With all due to respect to Regina, who is a friend, clearly the pencils exist and I have studied mine intensively enough to be confident that it is not a fake, which doesn't mean that it was made on the regular production line. Ever since pen production began there have been uncatalogued pens that have come off the line. We often call them lunchtime projects. Parker, for example, had a model shop where they made all sorts of crazy stuff, on company time. My guess, and it is *only a guess* is that these handful of pencils were produced off-line, so to speak, and that the chap(s) who made them (mine came, supposedly from the maker, a Pelikan employee, and I purchased it from someone in Germany who got it from him) has only decided to release them in the last four years. But this is all guesswork. I may try to do a bit more research through the Pelikan archives this summer (no I won't be there)--through e-mail. As far as the color of the captops, the only way to tell is to have a very high intensity light (LEDs are good for this) and to put it up against a black or brown part. It then becomes clear what the color is. You cannot depict it in an image. One other thing, have you tried contacting the seller for additional information? thank you very much for the description of your point of view. I really like your mantra and I also don't have a doubt, that these pens are original. We must live with the fact, that some parts of these pens history perhaps will stay in the dark. And this little mystery is the special appeal of our passion. I'll follow your advice with the LED later and will try again to identificate the colour of the cap rings. Now it's time for outdoor activities, because the summer has reached Berlin rather early this year. No, I haven't asked the seller for more information untill yet, because I'm suspecting, that she is not the former owner of this set (I have done business with her before and this is not the kind of item, which is typical for her repertoire). I think, she has sold the set in consignment. 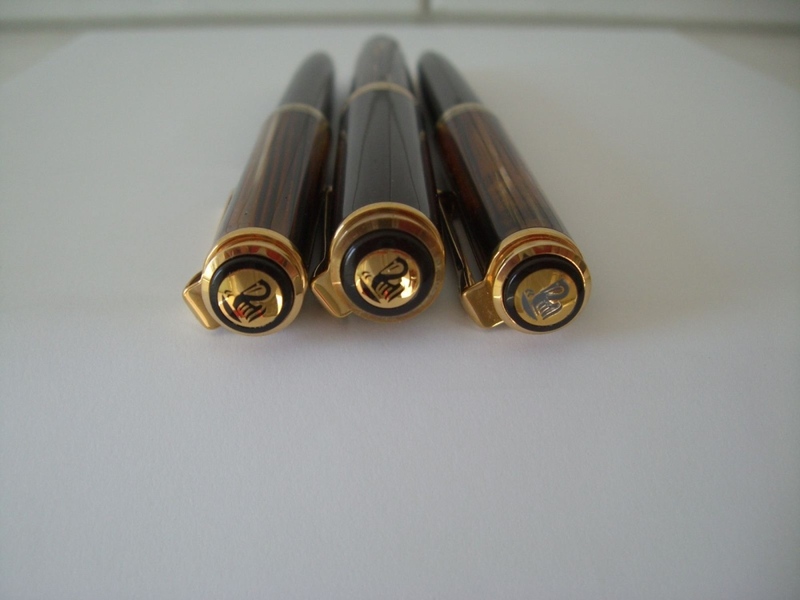 the story of the 800 tortoise as follows: A spanish customer ordered in 1990`s approx 750 fountain pens and ballpoints. Approx. 100 ballpoints stayed in the factory, they was sold in their shop for very cheap prices. A pencil was never made. I do not say the pencil is a fake - but pencils which are on the market, should be ballpoints. We all know that its very simple to convert the ballpoints to pencils. 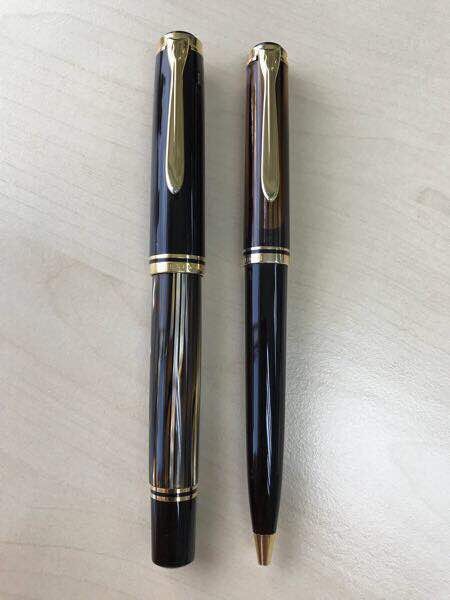 If you are buying a set today (or lets say in the future); its very important to doublecheck if you really got a 1990`s set or a recent one, since Pelikan is going to produce a brown 800 line!! Edited by martini, 26 May 2012 - 16:22. Is there a source for the Spanish story? The problem is that there is a near identical Japan story (which I suspect comes from the M&K 400NN). As far as converting the K800 to D800, of course. Easily done, all you do is change out refill for mechanism, except for the gray captop medallion, which is almost impossible to fake, particularly on the stamped first year logo. As far as the "forthcoming" pens, we shall see. No real word from the US importer, just rumor. I assume that if there is to be a tortoise 800 series it will have the current all-metal captop and be stamped on the capband "Souverän." first I want to say Thank you for your efforts for bringing a little light in this story. I have one last question: Do you know in which kind of present box the regulary 2-part-set was delivered to the customer? Is the wooden box, I showed above typical or was it used generally in that time for some Sovereigns? I can only assume, that the last case is true, because on the outer paper box, which is light dammaged, is only printed: Pelikan Pen Case „Black Oak“ 950 410. There is no reference to the content. as you know I am in the pen business since 32 years, and exactly the same time I am selling selling Pelikan pens. The story about the 800 spanish customer is well known. The gray pencil tops were used for all pencils during this period and they are easy to replace, too. Well, then, you must be correct! My turn to be curious. Who is the "Spanish customer"? very nice M800 set, are these going to be re-released anytime soon? I overheard last March from a person at the Pelikan Japan that brown tortoise M800s would be released this fall. Just like M101Ns, it will not be exactly the same as Spanish M800. Still I am looking forward to the new brown tortoise. I recently acquired an K800 OS BT to match with my M800 OS BT. 1. Unlike the D800 examples, my K800 came with grey stamped medallion disc. 2. When flashed with a strong light, the captop of K800 is brown in colour (same as M800). 3. Both my K800 & M800 are engraved with West Germany at the capring. 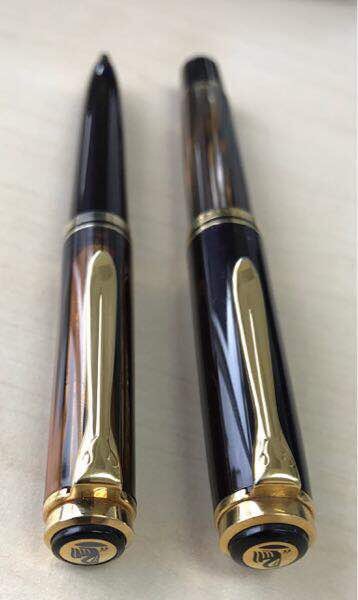 Pens for SaleMint & NIB Pelikan LE Pyramids of Gizah FP. The best way I found was to go to take a photo next to a regular M80x, that was the first time I noticed it! Edited by GranTorino25, 22 December 2017 - 00:30.